North side of Everest. We started our journey 53 days ago. From Katmundu to Lhassa, Giantze, Shigatze, Shegar and base camp at 5,300m. From plane to jeep, across the high Tibetain plateau, to the moraine of the Rongbuck glacier. On April 8th we established base camp at 5,300m. and started our active acclimatization, hiking many valley and peaks. We continued to ABC via interim camp on April 17th . Since then we climbed to North col and camp 2, we hiked down to Base camp for rest and wait for better weather. Overall the weather has been colder then usual and the jet stream is raging over the mountain. It is still early. Usually; base on the last couple seasons the jet stream dies down for a window of few days between May 24-28. But the Tibetan calendar that I carry along mention an unusual spring for this year 2049 . May is a double month, 60 days and the weather will improve only during the second part of the month. Meaning beginning of June for us westerner. May 28, 2005 – ABC 6,100m . Base on all the weather information, we Left ABC on May 22, for the comfort of BC at 5,300m. we stayed for 4 days, eating as much as possible, resting, watching few movies, taking showers. The beach really! Base on more forecast, we made the plan to head up for a summit push starting from base camp on May 26 continuing via interim camp. ABC by the 27th and continue to North col by the 30th . 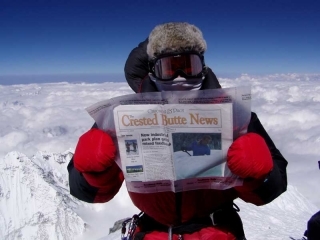 the weather is not cooperating , high wind prevail and already news come that few climbers died of exposure attempting to summit, A sherpas had frostbite. Many expeditions are running out of food, climbers become impatient; people are more likely to make the wrong decisions under those circumstances. May 31, 2005 – Camp 1 or North col 7,000m. Finally, After waiting an extra day at ABC we are on our way. This afternoon we reached camp 1 at 7,000m. We are using the bigger tent, planning for a good night sleep. We made it just find, but this snow slope along the North ridge is a slog. The wind was strong with blue sky . Monica started to use oxygen and her pace was excellent. We are going to enjoy some great views tonight looking at Cho Oyu 8,200m. that we climbed last September. An awakening today, from the snow slog to scree and rock band that demand great effort. But it was varied and now we are not just feeling high we are high. The views are magnificent especially of the summit now so close. Everybody is feeling good. It took quite some manpower to put up the tents with the very strong wind. Many tents that were up are now shredded by the wind. 10:00 pm my alarm reminded me of the day, a glorious day our summit day. I brew some hot tea, we eat few spoons of cereal but not much, started to shout to the others, Tom had some difficulty with his stove. Sherpas Dawa and Sonen were on the move.We slowly got dress, pack and regroup outside. Another team was already climbing the exit cracks. We prepared and started as plan, it was the most exciting moment starting to walk in that direction towards the summit, I felt a rush of adrenaline but at the same time I felt calm, focus, ready. We left by 11:15 pm, climbed the exit cracks and reach Mushroom rock by 2:15 am . There, we switched oxygen bottles and continue on climbing the first step in total darkness; by the time we reached the second step the first ray of sun were hitting the ridge around 5:15 am. We follow the ridge for a while pass the third step. We contacted Russel to check our status on our progression and the oxygen. Always better to ask those mathematical questions to someone who stay down low and can really assist you in the decision making process, even make sound decision for you. From there we traverse along the rock ledge were we crossed few of our friend coming down but without to much chat we passed each other the best way possible, on this tiny ledge. Up the dihedral and we found ourselves at the base of the snowy summit tower, few deep breaths, and we walked on until the view drop on all sides, It was 8:15am, 8,850m. on top of the world, a sea of clouds cover the world . Only the peaks above 7,000m were showing, the curve of the globe was so visible so far yet so close and the ideas that I am closer to space then earth. We enjoyed a full 1/2 hour on top before heading down , it was a warm day with almost no wind. Reaching camp 3.at 7,900m. around 5:30 pm tired but at peace! !